Published on 29 February 2008. Photo by Paul Watson, modified under licenceThe experiment in mini-posts seems to have worked well, and has received positive feedback from readers whilst being very easy for me to use. I therefore intend to continue with it. As you may have already noticed, I’ve made some changes to the display of the posts to give them a more permanent identity, as I felt that having a screaming headline format didn’t really work for the mini-posts. 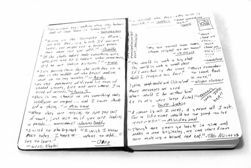 For that reason, I’ve renamed them ‘My Diary’, and given them their own special design, which I feel works rather well – and I hope you do too. Let me know what you think, keep commenting, and help the very discussion to thrive. This 1,267th post was filed under: Site Updates. Comment posted at 10:34 on 1st March 2008. I suggest making the diary headers a little smaller, and perhaps toning down the background colour – maybe it could be a sort of blue instead of yellow? I do like the idea of them having their own design though. Comment posted at 18:07 on 1st March 2008. I quite like the variation of the yellow – and a couple of people have commented that it brightens things up a bit. It’s supposed to bear a passing resemblance to a physical diary. Comment posted at 21:29 on 9th March 2008. Hmm, I’ve changed things again now… The yellow didn’t really work, did it? I’ve gone for an edited photo as a background now, which I think adds more of a personal touch. You like? Comment posted at 22:04 on 9th March 2008. That is better by an order of magnitude. I like it more now that it’s been toned down a bit and that the headers aren’t as shouty and cheese-tastic as before.